I’ve finally bought myself a Personal Locator Beacon (PLB; an ACR ResQLink  in my case), which I obviously hope I’ll never need to use. I was on the edge of buying one a couple of years ago, but put it off for a while when things changed. It arrived in the mail a few days ago. Several SAR incidents were making the news on the day that my PLB turned up. One of these occurred in the southern Ruahine Range. In this most actively-reported case, a PLB was activated by a tramping club group  which had taken a wrong turn in bad weather. In the Pohangina vicinity (here’s a map ) they’d planned (according to the club’s trip schedule ) to head up Shorts Track, follow the tops over .1380, .1405, .1350 and down to Ngamoko Hut, before eventually returning somehow via Toka Trig and down Knights Track. A navigation error in bad weather on the first day, however, in the vicinity of Whaingapuna (.1405), resulted in the group ending up in Piripiri Stream. They changed plans to attempt to follow it out to farmland, but found themselves bluffed by a very high waterfall. Contour lines on topo maps can sometimes be deceptive. Without further info I’m curious if they followed the stream down a gradual (but possibly tough) descent for a several kilometres, before it surprised them by dropping more steeply into a waterfall. Being the Ruahines, with thick alpine vegetation such as Leatherwood being common at certain elevations, an un-planned detour could easily turn into a demoralising, waterlogged nightmare without an easy escape. If anyone has clearer detail on how and where the party actually came to be stuck, it’d be awesome. A helicopter was tasked by RCCNZ from Palmerston North, but could not locate the trampers due to low cloud. The beacon was also transmitting positions over a wide area. 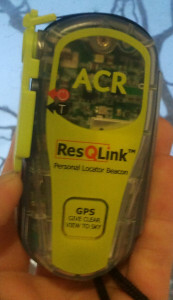 No GPS position was received from the beacon despite it being a GPS-enabled beacon. A second attempt to send in helicopters and ground teams was delayed by an extreme weather event hitting the area and then darkness fell. Land SAR teams were deployed and the decision was made to transfer the incident to the Police as a Category 1 incident as they had better communications with the search teams. Contrary to the stereotype helicopter-zip-in-zip-out easy-to-document-by-film-crew PLB rescues that have been recently portrayed in oblique 22-minute episodes of High Country Rescue , this incident involved a significant search component despite the use of a PLB, and despite that PLB having been designed to be GPS-equipped. Today’s 406 MHz PLBs can be GPS equipped to transmit an exact position, though some less expensive models don’t have that functionality, and merely transmit an emergency signal with identity information to satellites overhead. If a position isn’t transmitted, either because the GPS equipment is inhibited or because it’s non-existent, it’s generally possible for the satellites to triangulate an approximate position after several hours of listening, but only to within a circle of about several kilometres. It could possibly be worse in situations such as this where the signal was bouncing around, and that type of region can still be daunting to search if the geography and conditions are unforgiving. Modern PLBs also transmit on 121.5 MHz in parallel, and search aircraft usually carry equipment to be able to accurately home in on signals as they fly overhead. This can still be hindered, however, if aircraft are unavailable or unable to fly. The PLB involved was designed to transmit position information and it’s unclear why this didn’t occur, but having the subjects stuck in a deep ravine  may have prevented the device from obtaining a fix on the necessary satellites. Having its transmission bouncing off the sides of that ravine also complicated matters for the available and slow-moving ground-based direction-finding equipment, whilst it anecdotally appears that bouncing signals were the cause for different satellites to place the party at varying locations up to 7 km apart. after making the decision to activate a PLB, it’s critical to avoid moving from that position unless absolutely necessary, even if it’s tempting to do so to continue to try and find a way out. In both of these respects, the group certainly did the right thing after the PLB was activated. They were equipped to stay put, potentially for several more days (according to their claim). If they had decided after several hours, or after a day, to try and climb around the waterfall or return the way they came, it would have largely hindered the efforts of those around them to slowly home in on and reach the signal. Activating a PLB is a serious decision that can’t be undone, and should never be taken lightly. It causes a request for help to be relayed to rescue authorities in up to two places—the country in which the PLB is registered, and the country responsible for the location in which the PLB has been activated. In New Zealand, this authority is the Rescue Coordination Centre of New Zealand (RCCNZ) , a division of Maritime New Zealand of which I’ve been critical in the past  for how it communicates, but which I could also not fault for its efficiency or professionalism in responding to rescue requests. Upon activating a PLB, a chain of events is started that won’t stop until rescue officials are satisfied that no further action is necessary. Even if it takes time for a response team to reach the source location, moving away from that area will nearly always confuse matters, slow things down and put everyone involved at higher risk than they need to be. 3 Comments To "Staying put"
Kia ora Mike – I followed this with interest. A number of years ago I was solo in the Pohangina valley, Had come in via Knights, a top camp, Leon Kinvig, downriver to Ngamoko, then the plan was to return via the tops to Shorts and back out. Down on the river by Ngamoko I could hear the wind come up and as I climbed up the next morning the rain started and the wind was dire to say the least. There is a final large orange marker at the end of the track up, and at least back then the route was not poled. It was a whiteout and walking perhaps 10 metres beyond the marker I could barely make it out in the mist. That walk from the Ngamoko track to Shorts on a good day is a pleasant exercise, and though the ridge is fairly with spurs going off everywhere, as long as visibility is good the route is fairly obvious. I knew on this day it was just trouble. So went back to the hut to wait it out. The next day the wind was still howling up there so I headed down river intending to go out via Mid Pohangina to farmland and then find a place to ring my wife. I was packing up after a cuppa at Mid Poh when I heard the whirling thump of a chopper, and sure enough they were looking for me. They had followed the instructions I had left with my wife, the hut book from Kinvig, and then my substantial note at Ngamoko. I got a ride back to my car. I was a bit surprised they came looking that quickly as I was only overdue by 12 hours or so at that point. That was not long after the fuss over the search and rescue for the liquor baron guy who crashed his helicopter so I suspect they were a bit sensitive. My somewhat belaboured point is that had I had a beacon I don’t think I would have set it off. I wasn’t injured, just overdue, and thought it would have been at least 24 hours until the search would have begun. In the paper they were a bit critical of my not taking the pound of butter mountain radio, which I was not real happy about. If anything I should have taken my phone to call from the tops. I am now however, with age, considering a PLB, but never would consider such an item as a get of jail free card. As you wrote the weather conditions there were bad, and Ruahine creeks can be diabolical. Had one of them been badly injured it may have been a different outcome. I can’t figure out how they managed to head west out of the ranges, when the plan was to head down east to the hut, unless conditions were that bad they pulled the pin to just get down. Sorry for the long winded ramble. Hope you are well. Heading into the Ruahine at the end of July for 5 days. Can’t wait! Hi Robb. Thanks for the comment. I couldn’t suggest exactly what happened, either, but hopefully someone learns something one way or another. I thought it was interesting, in one report as things were unfolding, that a club officer didn’t know if the group had portable shelter or not. If it was a reliable quote then it sort-of suggests to me that the club doesn’t have much of a policy in that area, which (if that’s the case) is possibly something they could consider revising. In your case I guess once they’re out searching, they’ll do it properly. Shame about the assertiveness of initiating a search so early. Do you know how much info was available to Police about your preparedness? I also don’t get the mountain radio thing. It was also recommended in this instance, but is another big mess of conflicting messages. I know at least one person in LandSAR who reckons they’ve decided not to actively push them at all (compared with PLBs which are being pushed), basically on the grounds that the mountain radio service isn’t likely to be sustainably around forever considering how much it relies on voluntary radio expertise and commitment. The whole soap-box after the event pattern does seem to appear entirely on who gets to stand in the spotlight, though.